Industrial chemicals list USA supplier. Order now any grade & quantity. Fast delivery. Electroplating intermediates, additives for electroplating, and fine special chemicals for pharmaceuticals and organic synthesis. etc. BariteWorld Sulfonyl chemical products are made at BariteWorld ISO-9001 and ISO-14001 certified. We custom manufacture other sulfonyl chemicals upon request. Please contact us for specific inquiries. BariteWorld offers a full line of industrial chemicals for the Coatings, Adhesive, Plastics, Printing and Metal Working markets. Commerce offers solvents, containers, iron oxides, inorganic fibers, extender pigments, metallic pigments, titanium dioxide, corrosion inhibitors, organic pigments, effect pigments, dyes, calcium chlorides and more. Providing quality service for over 20 years with industry leading principals, technical expertise and exemplary customer service. BariteWorld offers a large range of industrial chemicals products used in many industries, and in stock at locations throughout North America. The specification sheet for each chemical is available upon request. We guarantee reliability, quality and competitive pricing. 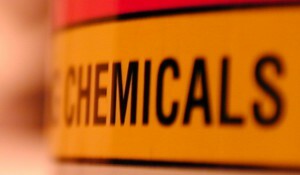 If the chemicals you are looking for are not listed – we will source it out for you. Any application, Any industry, Any Quantity.